Today, Foundry Group was recognized for creating the most positive impact for our workers based on an independent, comprehensive assessment administered by the nonprofit B Lab. Honorees are featured on B the Change, the digital Medium publication produced by B Lab, at bthechange.com/bestfortheworld. 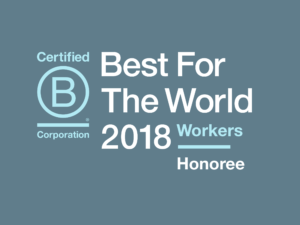 The Best For Workers list includes businesses that earned a Workers score in the top 10 percent of more than 2,400 Certified B Corporations on the B Impact Assessment. The assessment measures a company’s impact on its workers, community, customers and the environment. On an operational level, we have always sought to treat our team members, community, and the planet with respect and thoughtfulness. Engaging in the B Corp certification process provides us with the opportunity to quantify these things through the B Impact Assessment. Our team members are a big part of this and integral to our success as a firm. We were thrilled to learn we were being honored by B Lab for how we treat our team members. The 185 Best For Workers companies come from 58 different industries and 20 countries. B Lab simultaneously released separate lists recognizing B Corporations as Best For The World Overall impact, Best For Environment, Best For Customers, Best For Governance and Best For Community, which can be found at bthechange.com/bestfortheworld. In the fall, B Lab will release the Best For The World: Changemakers and the Best For The World: Funds lists.